Mark von Marksfeld lived in South Africa and Germany before moving to Vancouver. 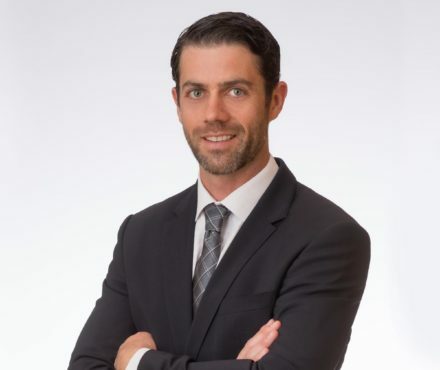 After graduating from the University of Western Ontario law school in 2002, Mark was called to the Bar of British Columbia and worked at a boutique business law firm before joining Lindsay Kenney LLP. As a partner, Mark’s practice is focused primarily in the areas of banking and secured lending, commercial real estate, and mergers and acquisitions. In the area of banking and secured lending, Mark acts on behalf of several Canadian chartered banks and private lenders by preparing loan and security documentation for construction lending, asset-based lending, lease financing, acquisition and merger financing, loan syndications and standard operating and term credit facilities, as well as providing advice on the application of statutes. In the area of commercial real estate, Mark advises clients in all aspects of real estate transactions and activities including leasing transactions on behalf of both landlords and tenants, acquisitions and divestitures of commercial real property, and the creation and implementation of various real estate ownership structures. Mark’s mergers and acquisitions practice includes acting for both purchasers and vendors in the purchase and sale of assets or shares, advising on various types of financing, advising on the formation and structuring of incorporations, partnerships, or joint ventures, and drafting and negotiating corporate and commercial contracts, shareholder agreements, partnership agreements and joint venture agreements. In his spare time, Mark enjoys golfing, soccer, skiing, and tennis. Acted for a Toronto-based Financial Corporation providing a $55,000,000 loan secured by a commercial property in Vancouver, British Columbia. Acted for a Toronto-based Real Estate Income Trust in the purchase of a $160,000,000 mixed-use complex in Burnaby, British Columbia. Acted for a Toronto-based Real Estate Income Trust in the purchased of a $25,000,000 residential apartment complex in North Vancouver, British Columbia. Acted for an international members-only warehouse club in the acquisition and redevelopment of various properties. Acted for a Vancouver-based client in the purchase of a $35,000,000 office building complex in Vancouver, British Columbia. Acted for a Toronto-based Real Estate Income Trust in the $18,000,000 purchase of a residential apartment complex in Victoria, British Columbia. Acted for a New York-based client in the purchase of a $27,000,000 shopping centre in the Lower Mainland. Acted for a New York-based client in the sale of a $56,000,000 commercial building in Edmonton, Alberta. a) Your response to this web page and/or any inquiry you make through our website does not create a lawyer/client relationship. Unless we are retained, we cannot guarantee or undertake to maintain your information in confidence. Anyone sending us confidential information prior to both parties agreeing that we will be your lawyers, runs the risk of disclosure and adverse use of their information. So, don’t send us anything confidential until you have talked to one of our lawyers and you have decided to retain us and we have agreed to act for you. b) Upon receipt of your contact information we will be in touch and will first check to make sure that we wouldn’t have a conflict if we act for you. That means that if we are already acting for, or have acted for someone involved in your dispute, we can’t take your file. If that is the case, we’ll advise you immediately and won’t be able to help you. c) The use of the internet or this form of communication with Lindsay Kenney LLP or any individual member of the firm is not secure and we cannot guarantee that information sent over the internet will remain confidential. d) Information on this website is for general use only, is not legal advice, and because there are so many variables, should not be relied upon by you to deal with your legal problems. If you choose to rely on it, you do so at your own risk. If you understand and agree to the above, click the Accept button below.